The name Colonnata may date back to the period of the Ancient Rome and is linked to the word “columna”. In fact, the marble in the columns was suitable for architectonical work. 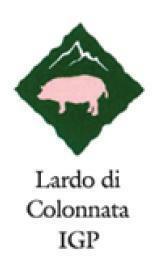 The Lardo di Colonnata PGI is produced in Colonnata, in the province of Massa Carrara. The production is still artisan and linked to traditions and family habits. It is a fat cold cut, obtained from the adipose layer that covers the entire spinal column of pork, from nape to buttocks. The cuts of meat from ten regions of northern Italy must be processed within 72 hours of slaughter. The maturation takes place inside the natural marble bowls called “conche” coming from the “dei canaloni” basin, which has a particular composition and structure that are indispensable for the optimal maturation of the product. Each bowl is covered with garlic and then filled with lard, sea salt, black pepper, rosemary and other pieces of garlic. Then the lard is covered and let rest for 6 months. For the phases of processing and maturing the Regulation provides the use of other spices such as cinnamon, star anise, coriander, nutmeg, cloves, sage, and oregano. The slice has a pinkish or slightly burnished white color, with a delicate and typical fragrance. The taste is sweet and spicy. It is served thinly sliced and matched with toasted bread, meat and fish. Very tasty with fruit and honey mustard. The bowls are made with white Carrara marble. Legend says that Michelangelo procured a lot of lard when he went to Colonnata to choose the marble blocks and make his statues. Thanks to the aromatic plants of the mountains and the typical bowls made with the marble, quarry workers of Colonnata had obtained an excellent maturation quality. Protected Geographical Indication (PGI) recognized under Reg.ne EU Reg.to CE n. 1856 of 26.10.2004 GUCE L.324 of 27.10.2004.